The Motobu Udun was an aristocratic family in the Ryukyu Kingdom of Okinawa. Its progenitor was Motobu Ōji Chohei (also known as Sho Koshin, 1655-1687), sixth son of the tenth monarch of the Second Sho Dynasty (1469-1879), Sho Shitsu (1629-1668). From the 17th century to the Meiji Reforms of the late 19th century, successive heads of the family held the rank of ōji or aji--below only the king himself--and served as vassals to the Shuri monarchy. The family excelled in both cultural and military fields, producing important politicians as well as performing and martial artists. As the term udun indicated blood relation to the monarch, families of this rank comprised the Ryukyuan counterpart to the miyake, or imperial family, of Japan. It referred to both the physical residence of the royal family and the royal personages who lived there. Motobu Ōji Chohei was born on May 4, 1655, the sixth son of King Sho Shitsu and his wife Honko. His wife was Urasaki Ōshu (princess), daughter of Adaniya Uēkata Seibo. In 1666, at the age of 11, Chohei received the domain of Motobu Magiri (now the village of Motobu in the northern part of the main island of Okinawa) and assumed the title of Motobu Ōji. From then on, successive heads of the house used the name Motobu. Motobu udundi is believed to originate with Chohei, but information about his activities and achievements was lost with the family genealogical record in the Pacific War, and the details of his personal history are not well known. Chohei was succeeded by his eldest son, Chokan, while his second son, Chotaku, was adopted into the Urazoe Aji family, becoming its heir. List of editors of the Kyūyō. Motobu Ōji Choryu's Chinese-style name of Sho Bunshi is in the fourth column from the right, with his Japanese-style name below. The name of the prime minister, Sai On, can also be seen in the first column on the right. Motobu Ōji Choryu (also known as Sho Bunshi) served as ucha udun bugyō, or master of ceremonies, at the seventh anniversary of the death of King Sho Tei in 1715. He was assisted in the staging of the ceremonial dances by the "minister of dance," or odoribugyō1, at the time, Tamagusuku Chokun2. Chokun was responsible for important contributions to the creation and development of classical Ryukyuan court dance. His third son, Choki3, served as chief retainer to Choryu. From this, the Motobu Udun family can be seen to have had a deep connection with Ryukyuan dance from its beginnings. Choryu was also active as a diplomat and in 1723 traveled to Satsuma to offer congratulations on the marriage of Shimazu Tsugutoyo, 22nd head of the Shimazu clan and fifth daimyō of the Satsuma domain. In 1723 Choryu again traveled to Satsuma to deliver correspondence regarding the birth of Shogun Tokugawa Yoshimune's grandchild Takechiyo, later Shogun Tokugawa Ieharu. In addition, Choyu participated in the compilation of the official history Kyūyō. In recognition of his service to the monarchy, he was granted the royal family name of Sho--written with a Chinese charater that could only be used by kings and princes--and the title ōji. 1. The odoribugyō was a minister who oversaw the training of dancers for performances at important occasions such as the anniversaries of the deaths of kings and visits by Chinese imperial envoys. 2. Tamagusuku Uēkata Chokun (1684-1734) was the sixth head of the Hedona family. In 1719, he staged the first recorded dramatic dances known as kumiodori for the Chinese envoys Kai Ho and Jo Hoko. Besides kumiodori, among the court dances the repertoire of the seven "women's dances" are said to be his works. 3. Okuhira Pechin Choki (1714-1766) became the eighth head of the Hedona family after the death of his elder brother Choka in 1744. In 1746, he became chief retainer to Motobu Ōji Choryu. He also inherited the Tansui-ryu school of music from his father and performed court dances for the Chinese envoys Zen Kai and Shu Ko in 1756. Map of Shuri in the 18th century. The residence of the Motobu Aji is on the upper right. Chokyu wrote in an extremely refined literary style, using the particle dainsu in his poems so often that in his later years he was known by the nickname "dainsu aji." Before a poetry reading, he was in the habit of going to the venue three or four hours early. 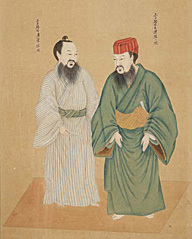 Wearing a kind of formal coat called kasabii, he would bring books of poetry such as Kokin wakashū, Tang shi xuan, the poems of Bai Juyi, Tale of Ise and Man'yōshū all wrapped up in a large cloth. These books he would study intently until the start of the reading. This may explain his ability to produce works that rank among the highest achievements in Ryukyuan poetry. The following poem of Chokyu's was adapted to be sung in the masterpiece of Ryukyuan dance known as Amakawa ("celestial river," or "Milky Way"). In a pond of the celestial river, a pair of Mandarin ducks at play. What vows they are pledging to each other, no one knows. It is also known that Chokyu traveled to Satsuma in 1773 as an envoy to deliver condolences on the death of the wife of Shimazu Tsugutoyo, fifth lord of the clan. 1. This is the Gushikawa Uēkata referred to as "the greatest martial artist of his time" in Motobu Choki's Watashi no karate-jutsu. A special cloth crown worn by Ryukyuan nobility. Aji would wear yellow or red ones like the above, known as akaji goshiki ukiori kan (red five-color-weave crown). Those worn by ōji also contained gold thread. Like his predecessors, Motobu Ōji Choei (also known as Sho Taiyu) was active as a diplomat, traveling to Satsuma in 1804, 1809, and 1814. Dispatches to Satsuma generally lasted from six months to just under a year. Although the duration of the stay was long, the envoys were engaged in many tasks during that time, beginning with a congratulatory address to the Satsuma Lord and continuing with visits to temples and shrines and attendance at poetry readings. From the histories of the heads of the Motobu family, it can be seen that the family had a deep connection with Japan as emissaries to Satsuma. Along with some of his ancestors, Choei was granted the royal family name Sho and the title ōji as reward for his service. Motobu Aji Chosho (also known as Sho Keiho) was a close aide to three Ryukyuan kings, Sho Ko, Sho Iku, and Sho Tai. He was also famous as a bushi, or martial artist. In 1855, he assumed the post of sōrikan (a kind of interim prime minister) and concluded a treaty with Admiral Guerin of the French navy. The sōrikan in Ryukyu had the extraordinary power to negotiate and conclude treaties with foreign countries in lieu of the king. It is said that Chosho was appointed to such an important position because of his kingly dignity and presence. In 1859, he traveled to Satsuma to deliver condolences on the death of Shimazu Nariakira the preceding year. Motobu Choyu was known as the inheritor of Motobu udundi and a man of culture and refinement who enjoyed Ryukyuan dance and poetry. In the time of the Ryukyu Kingdom, he went by the formal name Inoha Aji Choyu. The title Inoha Aji denoted that he was the heir of the Motobu Aji, and was bestowed upon him by the king at his coming of age. Motobu Choyu's younger brother Motobu Choki was the third son of the family and is known around the world as one of the greatest practitioners in the history of Okinawan karate. Relocating to the Japanese mainland in the Taisho Period, he pioneered the spread and popularization of karate, an accomplishment for which he is remembered to this day. Kin of the Motobu Udun around this time included members of a branch of the family, Kyan Chofu (born Motonaga Chofu) and Kyan Chotoku (real name, Motonaga Chotoku).1 Father and son, they were both famous practitioners of karate. It is because of producing distinguished martial artists like these that the Motobu Udun came to be known as one of the great martial families of Ryukyu. 1. Kyan Uēkata Chofu (also known as Sho Ishin, born 1839) was the eldest son of Motonaga Choyo and a member of the 8th generation of the Motobu clan. His grandmother was Manabe, the third daughter of Kyan Uēkata Chocho. Chofu was adopted into the Kyan family as its heir at the age of 17. He studied karate under Matsumura Sokon. Chofu's third son Chotoku was adopted back into the Motonaga family in order to continue the succession of his father's family but he continued to use his birth name Kyan until his latter years. The family crest of the Motobu Udun is a circle containing three comma-like shapes rotating clockwise. The inner design was a royal crest known in Ryukyu as hijyaigumun. It was a sacred symbol allowed to be used only by members of the monarchy and royal family. The grouped comma shapes are said to represent the unification of the three kingdoms of Hokuzan, Chuzan, and Nanzan. As a symbol of Ryukyuan unification, it also symbolized the royal family under which Ryukyu was united. Starting with the Motobu Udun, families of the udun rank added their own particular border designs around the central motif.